I popped over to Borough market the other day. It was typical British weather. Miserable weeping skies and wind to blow it straight in your face. Being a glasses wearer I was effectively blind. Thank goodness Borough market is under cover. I took refuge there. I never get tired of Borough market, the range of quality artisan food is unrivalled in London. I could happily spend a small fortune there and do a shop for the week. Two things stop me. I am not Bill Gates, and fresh food really deserves immediate attention. I tend to buy for that day or maybe a weekend as a treat. If I lived closer, I would be considerably poorer. It’s lovely to go down once in a while and shop in the vibrant buzz of the market rather than pushing a trolley down a soul-less aisle. I picked up (amongst other things), some fat Toulouse sausages from The Ginger Pig, a fantastic butcher whose animals come from their own farms. 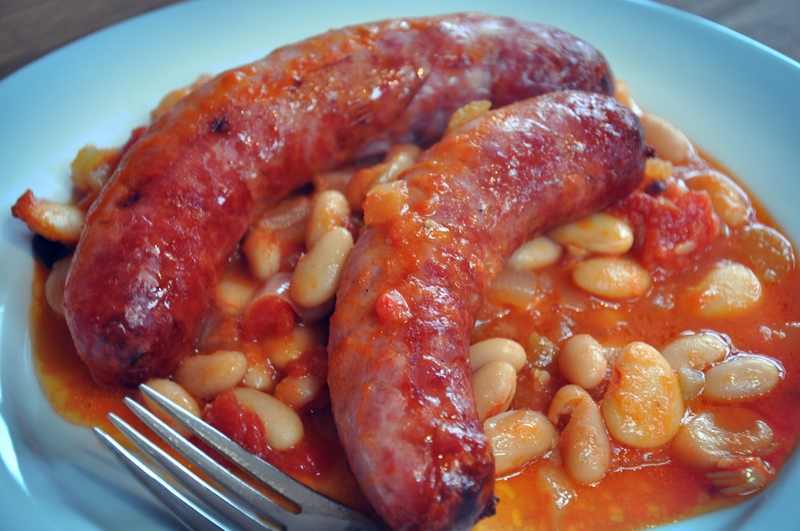 I wanted to make a quick lunch that used the sausages and pretty much only store cupboard ingredients. 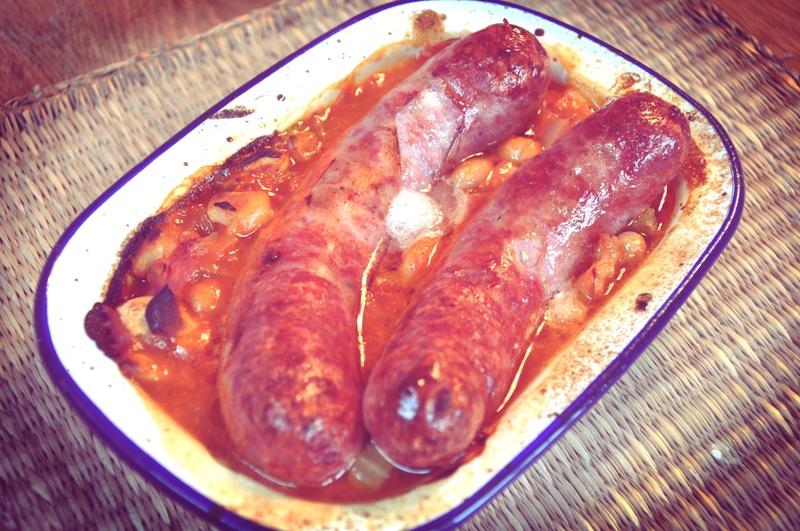 Taking my inspiration from cassoulet (and baked beans) this is what I came up with. 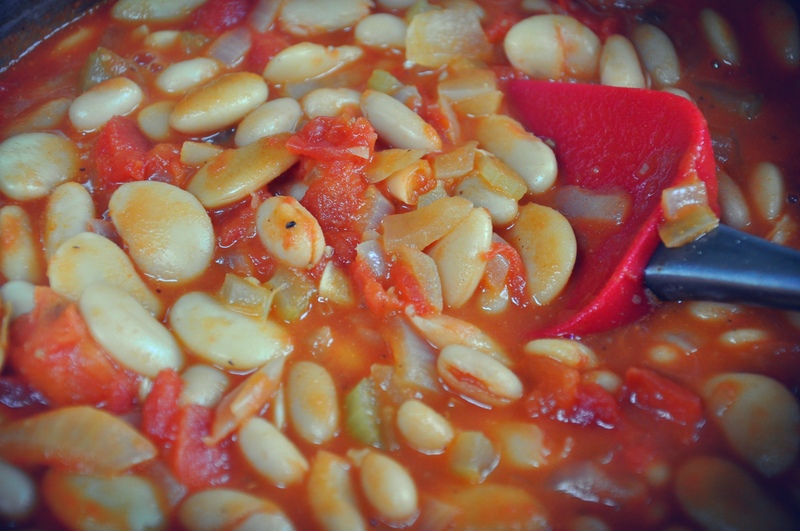 A prefect winter lunch or supper. Serve with some crusty white bread to soak up the juices. It would be nice to add a little chopped parsley stirred in. I didn’t have any, so I didn’t use any.